Editor's Note: Newfane artist Caryn King gathered some of her peers in the area to mount a two-day "Farm Art" exhibit in collaboration with the Strolling of the Heifers celebration weekend. Stop by The River Garden at 157 Main St. during Gallery Walk, or sometime on Saturday, to enjoy the fruits of their imagination and skill. Farm Art project coordinator and exhibitor Caryn King shares: "I am very excited that the Strolling of the Heifers organization welcomed my idea of combining 'Farm Art' with their parade and farm celebration weekend. It was very easy to get five artists to join me for this show, since Southern Vermont is full of artists whose work reflects the wonderful landscape and inhabitants of Vermont country life. This exhibit shows both the appreciation that we artists have for the region's natural beauty and our appreciation of what the Strolling of the Heifers organization supports." Caryn has gathered the following information and images from each artist to share with Gallery Walk guide readers and online visitors. 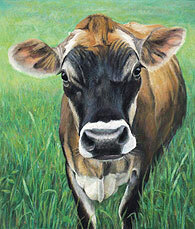 "I love the process of painting, the textures and effects the paint creates," says Caryn King, "and I love animals! Watching chickens or observing cows, and watching the cows watch me, are some of my best times. 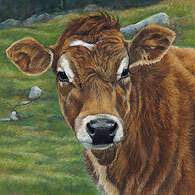 And then I bring photos back to my studio and enjoy all the time I spend painting each animal." After graduating from Rhode Island School of Design, Lesley Heathcote moved to New York City, where she worked in the field of commercial photography while exploring her creativity as a painter. After twenty years of urban living, she relocated to Vermont, returning to a place she loved as a child. This move led to a change in her style of painting, from symbolic to realistic. Workshops with Robert Carsten P.S.A. inspired her to begin working with pastels, combining her love of drawing and painting. Her current work focuses on birds and animals. Through close observation and attention to detail, she conveys both their individual personality and their relationship to the environment. 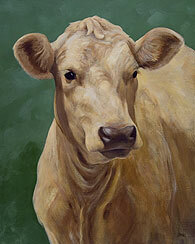 She reveals the spirit and intelligence of these beings while capturing their beauty. Paul Stone's oil paintings portray habitable spaces, landscapes shaped by the purposeful interaction of humans with their environment. His work pays homage to the well-husbanded countryside of Vermont; buildings crafted by hand, meadows kept, forests walked, and water moved upon. These paintings reveal the weight of character which human effort has endowed on the landscape and an underlying spirit of place. A life-long resident of Windham County, Steven Meyer graduated from The Columbus College of Art and Design in Ohio. 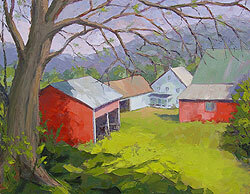 He has taken workshops with Ken Beck, Wolf Kahn, Joel Babb, and John Traynor, and attended the Vermont Studio Center. A former member of the Windham Art Gallery, he paints landscapes and still-lifes in oil on canvas and masonite, working outdoors from life and then creating studio paintings from those studies. "I am part of this Farm exhibit as I react to sights around me," shares Marjorie Sayer. "Barns still standing, weathered and canted, tell the story of New England. They are shelters for animals from the weather, the keepers of long-loved tools. They abound with pungent odors of grain freshly threshed; of apples and hay. They are faded red, brown, white, and grey and wind-worn. They elicit memories of childhood and tell of the resurgent return to the land. 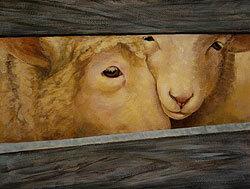 My painting shows the warmth and feelings that Farms bring to us all. They change with the seasons and the light of the sky. Just like people." Since moving to Vermont in 2006, Guilford-based painter Marjorie Sayer has returned to painting after an absence of 35 years. Her goal is to explore ways to experiment with the Vermont landscape in different spatial relationships. Her paintings negotiate the complicated intersections between abstract and the concrete. "I want the barn to exist and be recognizable but gradually become more abstract by bold strokes of color and gesture," Sayer says. "The finished paintings are a result of numerous layers of paint creating a sense of tension between areas of lightness and heaviness, and between barely visible outlines and planes of color." 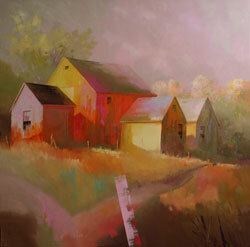 The landscapes embrace the ground, sky, barns and are joyful and rich with color. "I love the expressive tactile quality that I arrive at by using Impasto oil paint applied with a palette knife. The creation of the painting is rapid, and the result is texture and exhilaration," she says. Her response to both the figure and to landscape is immediate. It is visceral. Charcoal highlights the gesture in mark making. Ms. Sayer received her BFA from Cornell University, with a semester abroad at the University of Florence, Italy. She studied for her Master's in History of Art at NYU and the University of Munich, Germany, and painted at the Art Student's League in New York City. After many years away from painting, she studied with Tim Harney -- a taskmaster of organization, clear color, and form -- at the DeCordova Museum School in Lincoln, Massachusetts.